With his extensive first-hand knowledge of the Canal's operations gained through his more than 30 years of service, Chief Engineer Drohan used the years leading to the referendum – as did other professionals – to independently study and offer a lower risk plan compatible to the site. With his analysis of the pitfalls of the current plan, he argued for a sustainable expansion with time to responsibly manage its costs, its risks, and not exacerbate its engineering challenges. The bidding process for the construction of larger new locks would have benefited from that better use of time. The many bidding delays caused by the confusing and incomplete requirements of the hurriedly-assembled project plan – that have carried deep into the present project's execution phase – would have been resolved by first enhancing the existing system. A much improved plan would be in place todayhad Canal planners been given the opportunity to consider better solutions for this expansion than the lock system now being constructed. In a face-to-face dialogue between the stakeholders' advocacy coalition, Alianza ProPanamá, and the ACP – arranged by Development Banks financing the venture – Canal representatives claimed that it could be shown “on the back of an envelope” that a two-lane two-step lock arrangement, such as that suggested by Professor Shelton based on the Pedro Miguel Locks, is not competitive. However, no “envelope” to substantiate that claim was produced. Looking back to shortly before the announcement of the Project in 2002, when Professor Shelton contacted and introduced Panama Canal Engineers to the lateral chamber-to-chamber water-saving capability of the Canal's original locks, the second water-saving method – available to only the Pedro-Miguel Locks – was equally unknown to them. Combined, these make Professor Shelton's suggested arrangement far superior to what is now being built. Given that the shipping community was told this Project was phase one of a two-lane expansion, his arrangement would have given that end result for the same cost as the single-lane now under construction. Interestingly, the Panamanian public was not informed about the promised second lane. Previous to Panamá's vote, several other alternatives were independently brought to the ACP's attention in a short space of time. Among them was a mechanical ship-lifting device, also developed andpresented to ACP decision-makers by Mr. Shelton, which could increase transit capacity significantly should evaluations prove it to be economically competitive and environmentally workable. He had taken exception to the declaration – made on a Discovery Channel program in 2002 featuring the Panama Canal Expansion Plan – that Mechanical Ship Lifts of the size needed for the project were “beyond extreme engineering”. 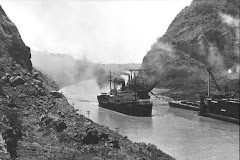 However, the Panama Canal crosses a major active fault that is considered a powder-keg that could blow at any moment. It has always been suspected that the Canal's earthquake risk was significant. How significant was confirmed as early as 2005, but to avoid losing momentum on the Project, this data has been kept out of mainstream news worldwide. Even if the Panama Canal plan was perfect and of low-risk, critics of the port expansions do not believe the shipping business growth forecasts used in promoting those projects. They do not envision that the shipping industry's use of Post-Panamax ships will grow at the rate needed to generate enough new business to make the majority of the expanded ports profitable in the claimed timeframe. As a result, the public will be straddled with paying to maintain ports while waiting for business to pick up. Now, for example, as Development Banks address requests from stakeholders for formal reviews of the Project, obtaining data and other specific information continues to be difficult. The ongoing unavailability of information has reinforced the persistent perception that either everything is not online, or it simply does not exist; and, the lack of openness suggests the Project is far from transparent. As the end of 2013 approaches and despite being more than two years into the Development Bank Loan Compliance Process of various lending institutions, the choice by the ACP to stonewall third-party review efforts – by not producing the requested reports while asserting that all are available online – persists. If the Project did not perform the necessary work and what is being requested does not exist – as this stonewalling strongly suggests – then it would even more strongly suggest that the Panama Canal Expansion Project does not qualify for the loans it obtained. Thirdly, such actions should be taken on the basis of multiple deception in the matter of withholding seismic assessment study findings – available as early as 2005 – from the Development Banks' loan approval deliberation processes, and from the people of Panamá who are ultimately responsible for loan repayment. Even today, the people of Panamá have not been made aware of the threat to themselves, their structures, and to the country's principal revenue-generating asset from an impending high-magnitude earthquake. To be informed years into lock construction – as Alianza ProPanamá's representatives were told in the midst of arguments regarding how ships traveling through the chambers are to be controlled to avoid collisions that damage both the ships and the locks – that the contractor has the option to make modifications, such as to the lock dimensions to correct those problems, and to allude that is what has been done, is unacceptable. The facts about the Panama Canal Expansion Project – adding improperly chosen, if not imposed, new locks to this crucial waterway – highlight its many very serious technical failings, population affectations, and environmental impacts that must be addressed and brought into compliance. These – added to concerns about its return-on-investment and the potential catastrophic loss of the Panama Canal due to its vulnerability to earthquakes – lead to the worrying conclusion of the whole affair possibly being fraudulent at its core.